I was actually walking back home and opened my eyes a little. I always pass this tattoo shop, and for some reason this time there was this little boy sitting in the doorway reading a book! 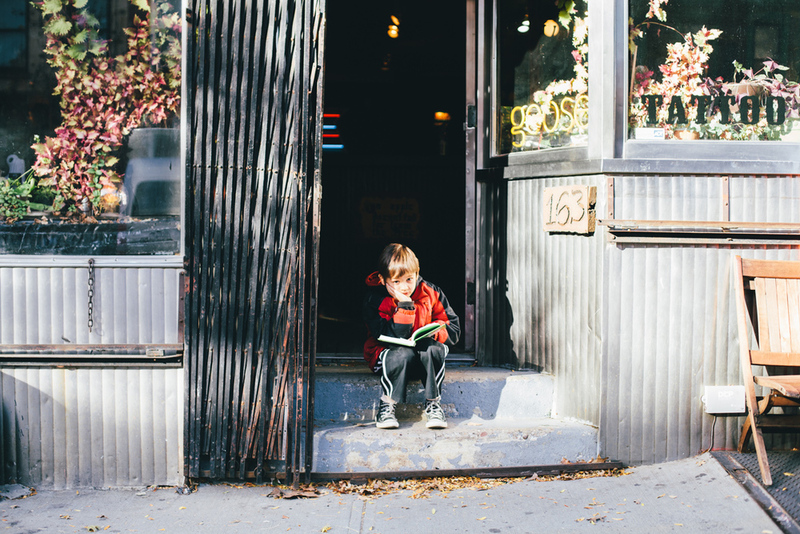 First off I was taken back that this little boy was "reading" a book, and then I was even more thrown off by the fact he was just chilling in front of a tattoo shop. Something about the fact he was so into this book and not an ipad. Ipad's are taking over the world these days, especially with kids. They know how to work those things more then adults. Anyways the boy noticed me, and I asked him if I could take some photos. He said yes and I told him to stay how he was but to look down...then when I count to 3 just look up. He did so...perfectly I might add, and below is the result. Such a lovely moment. Then I needed to walk around and enjoy the last fallen leaves that make the streets come alive. I do love snuggly weather, but boy does NYC take that to a whole another level. It has been teasing us lately, and I must admit I am dreading the blistering winds that are coming. Also it actually just turned 12 as I am writing this so I would like to give a shout out to my AMAZING / BEAUTIFUL / LOVING / SMART Momma. Happy Birthday Mom I LOVE you and I am so thankful that you are my mom. You have allowed me to follow my dreams, and I appreciate/love you more then you know.